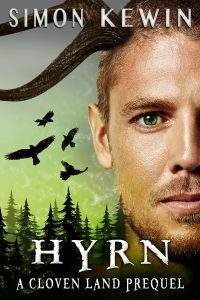 This novella is a root tale for my Cloven Land fantasy trilogy. As I was writing the trilogy, I referred back to certain characters and events in the past, and the more I did so the more I wanted to dramatise those past events and bring them to life. They became Hyrn: a complete story in its own right, but one that sets in motion everything that takes place in the later trilogy. Some of the characters had already been glimpsed or mentioned in the trilogy of books that follow on from Hyrn. In a way they were already there in my head waiting for their story to be written. Other characters grew with the telling of Hyrn, especially as I discovered their connections to later events. The world changed one bright morning in spring. Black Meg sat in the glow of the sunrise, drained but contented from her work. A difficult birth. Young Liana had laboured through a day and a night. As was so often the way with the first. Meg had been there throughout, sitting beside the girl’s mother and the wide-eyed lad who was the father. Most of the time Meg had been nothing more than an encouraging word, a reassuring grip. Only towards the end had she worked spells to draw off the worst of the girl’s pain, take it into her own body. She was accustomed to it. Over the years she’d lived through hundreds of births. Only two had been her own children. And now baby and mother were sleeping, curled together in their exhausted bliss. Meg sat against the cool stone exterior of Liana’s house, her black shawl pulled around her shoulders. Away in the east, Anwards, a deformed sun bulged from the horizon. She closed her eyes, savouring the first warmth on her face. The world was a troubled place, but a birth brought with it the promise of possibilities. A renewed hope. Satisfied, she let herself drift into a welcome half-sleep. The dragon’s approach rumbled in her bones before the beat of its wings reached her ears. The aura of despair seeped into her, sucking out her remaining energy. She opened her eyes. Couldn’t they give her a little peace? But no. A witch’s work was never done. Groaning from the effort, she forced herself to stand, muttering words to shield herself from the worst effects of the creature’s baleful influence. She wasn’t strong enough to stave it off, not at the moment, but she could hide herself from it. Let it slip around her like water around a rock. It was a simple enough spell, one she used often as she went about her work in Angere. The dragon glided low over the treetops, wings swept wide, the leaves lashing at the creature’s passing. It pitched to one side, turned and thumped to the ground, its bulk dwarfing Liana’s home. In truth Meg rarely saw a wyrm up close. They were a shadow blotting out the sun as they flew by on some errand. They were a roar echoing off the hillsides. She wondered how far this one had come. There was an archway at Wyrmfell, the opening of one of the roads the riders used to criss-cross Angere. But she had no knowledge of where the archways led or which connected with which. The beast’s body bore signs of fighting. Livid scorch marks and more than one open wound scarred its scales. The stench of singed flesh came to Meg as the dragon’s ruby eyes warily studied the sky. The sight of the beast sent dread flooding through Meg. Only one creature could gouge such marks on a dragon. Another dragon. Of late she’d been haunted by fears of her world tearing in two, of things tumbling out of control. Rumours about the King and his fascination with the arts of the death mancers swirled throughout the land. Her anxieties returned to her now. Dragons were fighting dragons. It could mean only one thing. King Menhroth had made his decision, undergone the rites. Now everything would change. Friends would became enemies and wounds too wide to heal would be opened. She’d told herself it wouldn’t happen; that her fears were unfounded. But she’d been wrong.